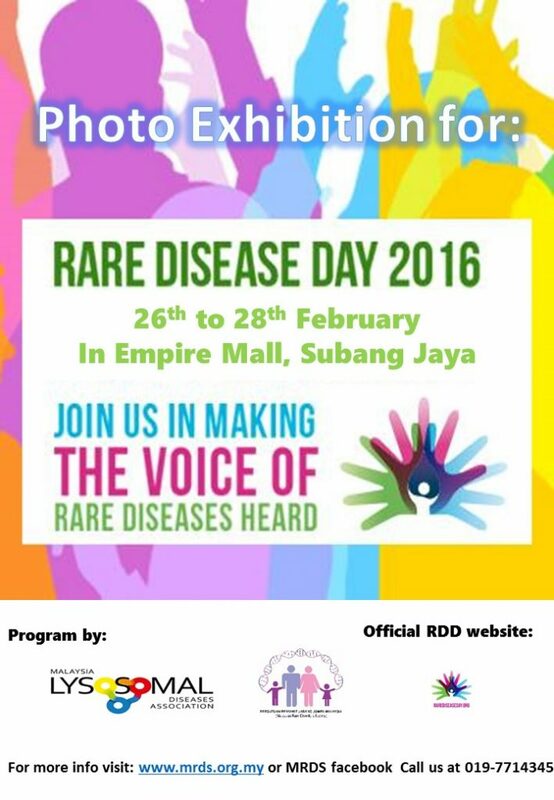 To mark Rare Disease Day 2016, MRDS together with Malaysia Lysosomal Diseases Association are holding a photo exhibition located at Ground Floor (near Chilli’s Restaurant), Empire Shopping Gallery, Subang Jaya, Selangor from 26th to 28th February, 2016. Time of the exhibition is 11am to 8pm. The photo exhibition will display photos and information about young Malaysians with rare diseases. Ms Hannah Yeoh, the state assemblywoman of Subang Jaya has been invited to launch the event on 27 February 2016. The public is invited to view the exhibition and find out more about rare disorders.